Together, the new learning spaces and improved visitor facilities at the site are part of a long-term master plan to create a world-class heritage attraction that will help to engage and inspire the anticipated 500,000 annual visitors by 2020. The aim of the new centre is to enhance and improve the visitor welcome and experience at the museum, the new visitor centre will provide a dedicated entrance that is able to efficiently cater for up to 5,000 visitors per day. The existing Rolfe Street entrance building, which is situated next to the proposed visitors centre, will be re-purposed into a dedicated learning centre. That will see the new visitor centre process ticket sales, give a brief introduction to the history of the Black Country and BCLM and provide retail, café and toilet facilities enabling the Museum’s current Rolfe Street entrance building to be repurposed as a dedicated Learning Centre. The buildings, which are elevated on the hill to make the most of the views towards the BCLM, will sit on a plinth of traditional Staffordshire red brick. Metal cladding to the façade takes reference from the metal panels used on the existing cottages on site. The roof, which will be made from black standing-seam zinc, is created by a series of folding planes which are supported by a steel diagrid structure. The new learning centre aims to deliver inspirational learning activities to the 90,000 school children that visit each year. Used for both formal and informal learning, the learning centre will also provide conference facilities, an area for lunch and a dedicated entrance for staff and children’s parties. Versatile workshop spaces will be created that can be used for a variety of creative hands-on learning activities, primarily for school groups, but also for family and adult learning sessions. The renovation of the existing building is mindful of the existing architecture and strives to enhance it – existing suspended ceilings are to be removed to reveal soffits and exposed brickwork will add texture and use a material that is widespread within the Museum site. 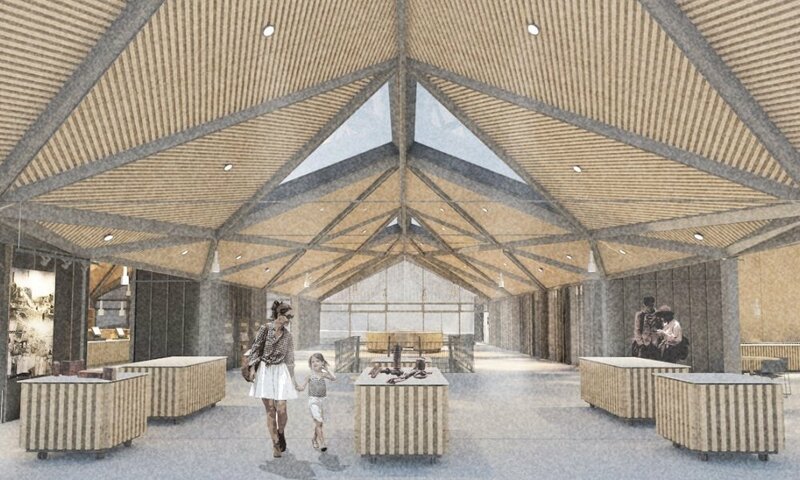 Emerging practice, Napier Clarke Architects, was the winner of an open international competition to design the £6m visitor centre and learning centre at the Black Country Living Museum. Napier Clarke Architects will be working alongside services engineer BWB Consulting, structural engineer Donald McIntyre Design, and landscape architect Red Kite Network to develop their design proposals with the Museum. The new Black Country Living Museum Visitor Centre has been designed to maximise sustainability issues. Throughout the design process the orientation, building fabric and services design have been maximised to create a building that has a low energy demand. 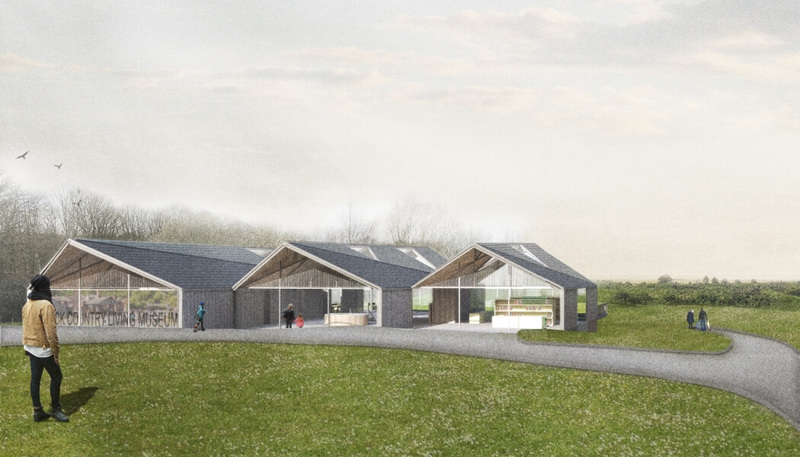 The new Visitor Centre benefits from having a North – South orientation with glazed gable ends. These large areas of glazing along with the addition of rooflights maximises daylight penetration. To prevent risks of overheating in the summer the glass has a high specification to reduce the solar gain without impacting on the amount of daylight that is able to pass through. In addition to the glazing selection a brise soleil has been introduced to the south elevation, reducing the penetrating rays of the sun into the space. One major challenge faced in the design was the lack of gas available on site. An all-electric building was required which added greater impetus to ensure the design focused on a fabric first approach rather than reliance on installed engineering services. This led the building to being primarily naturally ventilated. The natural ventilation system is achieved through a combination of high level opening windows and ventilation cores at the centre of the building. These will be fully automatic and are designed to meet the latest guidance on overheating in naturally ventilated buildings. In the winter months the building will be heated via air source heat pumps, a renewable energy, serving underfloor heating circuits throughout the building. Another key energy use that is important to consider in a building of this size is the lighting. With this in mind the new Visitor Centre will have LED lighting with long life spans throughout and benefits from a modern controls system that will allow daylight dimming. This ensures that between the light fittings chosen and the controls provided the Visitor Centre will get maximum performance while minimising the energy required. In addition to all the energy saving measures incorporated throughout the building there is a rainwater harvesting system to reduce the water demand of the building. The rain water is captured from the roof and collected within a rainwater harvesting tank where it is filtered and treated before being used to serve all WC cisterns and urinals. The BCLM has embraced the impetus for more renewable transport and the new car park will have a number of Electric Vehicle Charging bays as well as cycle parking areas.